I don’t like Christmas. It’s true. Rather than dwell on that though, I will dwell on what I do like, another Cryo Chamber collaboration honouring the master of the eldritch, one H.P Lovecraft. And it is out this December, which is the perfect antidote to all the dross about that fat red guy jumping down chimneys. This collaboration is named Shub-Niggurath, after a tentacled dark god with universal appeal to the peoples of Lovecraft’s shadowy worlds. Album Blurb: A 2 hour dark soundscape album recorded by 20 ambient artists to pay tribute to H.P. Lovecraft. Dark sounds from dreamy dimensions to never ending cursed forests. Join us in the ritual of lust for the Black Goat of the Woods. 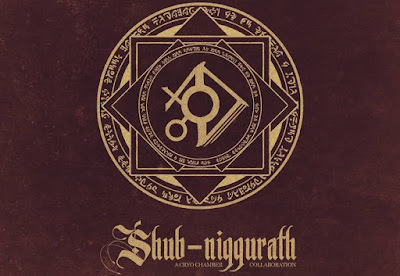 As with previous collaborations, Shub-Niggurath comes as a couple of hour-long tracks, in which the various artists get to flex their aural muscles and stamp their own brand of murk onto things. A little like a Lovecraftian pass the parcel, except with something you’d actually want to have at the end of things, rather than a chocolate coin or plastic comb. As it’s two long tracks, I will keep my comments quite general, but still relate the things that grabbed me. The album opens with the taut beat of a drum, first singular beats, but ramping up into a more ritual-like rhythm a little later. It doesn’t take long for one of the things I most like about the album to emerge after this: the sound of eerie flute/pipe notes. Maybe I am overly enraptured with the concept of the mad god Azathoth, his throne of chaos, and the “thin flutes piping mindlessly”, but I find that kind of sound far more sinister and sacrilegious than a lot of other sounds. These flute-based sounds appear quite often on Shub-Niggurath, and each time they do, I smile. The other element that occurs at quite regular intervals are discordant string-based notes. These bow and scythe their way through the soundscape, any other flavour sounds bolstered by their allusions to things being “not right” and madness. As far as specific impressions, my absolute favourite occurs during track two, around 12 minutes in. The soundscape hushes and falls relatively quiet. A wheezing, breath-like sound insinuates itself, and before you know it, you feel surrounded by gurgling sighing things, glugging their way out of the murk. To me, this was the audio equivalent of being at a lakeside, looking away, looking back, and seeing strange creatures’ heads surfacing in the still water. There are a number of moments on Shub-Niggurath that conjure this swampy, humid feeling, of the trees being too close, the ground too moist and the movement at the edge of your eyes being too unsettling. Of course, I liked this a great deal. Another compelling moment for me, occurred on track one, about 43 minutes in. The sound of chimes and rain soothes, but there is soon a deep whooshing rumbling rhythm that mingles with dripping water. It kind of made me think about what a twisted Ent (of LOTR fame) might sound like, crumping through the landscape. It isn’t too long after this that you hear strange vocalizations, and what sounds like a heartbeat, mixed with curious creature calls. Eerie and magnificent. There are also ample opportunities to hear the sounds of scurrying, wet, chitinous things scrambling through the various soundscapes, so I hope you enjoy creepy crawlies. Shub-Niggurath is a fitting tribute to another of H.P Lovecraft’s dark gods. The soundscapes created by the various artists all dance around this theme, some are dark, some are so murky even the vision of a Great Old One might struggle to pick out any light. What they all are though, are a remarkable journey into ominous valleys of thought and superstition. The long running-time only aids this feeling, and listening to the whole thing in one long session (if you have the time), leaves the listener feeling like they have travelled much further than the distance their eyelids might have closed. I’ve listened to it a number of times, but I’m sure it will take many more listens to fully take in what is going on. 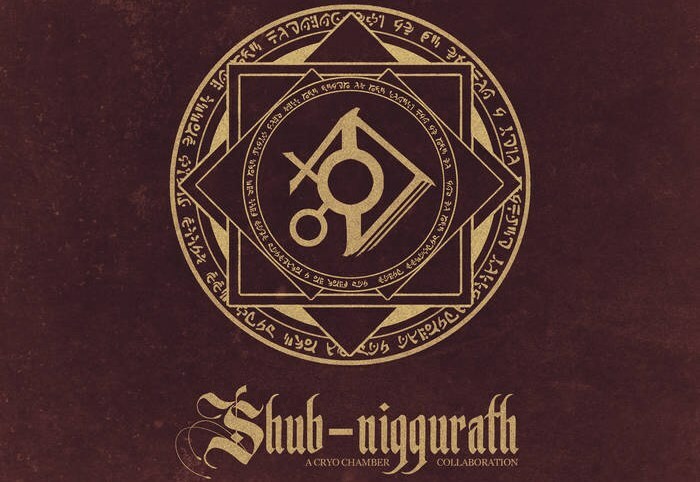 As far as I can tell though, Shub-Niggurath is a fine addition to any dark ambient fan’s collection. Artists: Cryo Chamber Collaboration: Atrium Carceri, God Body Disconnect, Dronny Darko, ProtoU, Kolhoosi 13, Neizvestija, Northumbria, Apocryphos, Randal Collier-Ford, Dead Melodies, Flowers for Bodysnatchers, Ager Sonus, Council of Nine, Kammarheit, Gydja, Creation VI, Darkrad, Aegri Somnia, Ugasanie, SiJ, Alphaxone, Keosz.